The universe-shattering crossover... the laws of time said should never happen! Under attack by the Reapers, antibodies of the universe! A photo that should never have been taken, that spells doom for reality! A breathless chase through three TARDISes! A hidden enemy lurking outside of known time! Three Doctors, three companions... and a whole host of heated discussions, flailing arms, and perfectly-phrased insults between immortal Time Lords who really should know better! Don't miss this unforgettable first meeting between the tenth, eleventh and twelfth Doctors, with guest cameos from past incarnations, and an astonishing mystery at its heart! 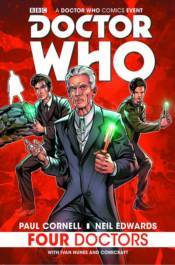 Written by Paul Cornell, Hugo Award-winning author of Doctor Who episodes 'Father's Day' and 'Human Nature/The Family of Blood,' and drawn by Neil Edwards, this crossover adventure will take you from the Time War to 1920s Paris, and on to the ends of the universe! This one has it all!